Whether you’re seeking a small, intimate, or elopement style wedding venue in Devon, or you have plans to celebrate your wedding day with many guests, you can be sure of a stunning setting in which to marry and share your wedding vows at Coombe Trenchard. Couples prefering a traditional church wedding are invited to make contact with the beautiful St.Peters Church at Lewtrenchard, which is just a short walk away from Coombe Trenchard. If you dream of having an intimate wedding with just the two of you, and maybe a few friends and family - we would be delighted to welcome you and put together the ideal wedding ceremony and support arrangements for you. You can simply choose to hire Coombe Trenchard and handle all of the plans and your choice of suppliers yourself - or if you are considering handing over all of the arrangements, we can take care of everything for you. 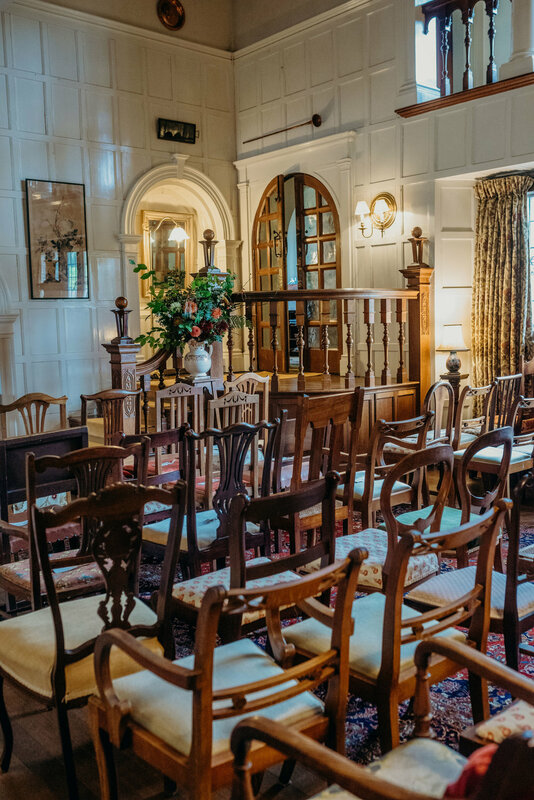 Coombe Trenchard has 12 romantic private ceremony locations, and what happens before and indeed after the ceremony is entirely up to you. We can be involved or as un-involved as you wish - and nothing will be too much trouble, no matter how few of you there may be. Coombe Trenchards panelled Grand Hall with high vaulted ceiling, huge granite fireplaces and minstrels gallery really does create a striking and elegant atmosphere for a memorable ceremony, or for an outdoor setting that is unique and extra special, consider our romantic wisteria clad Clock Tower, or our Coach House complete with a covered courtyard.